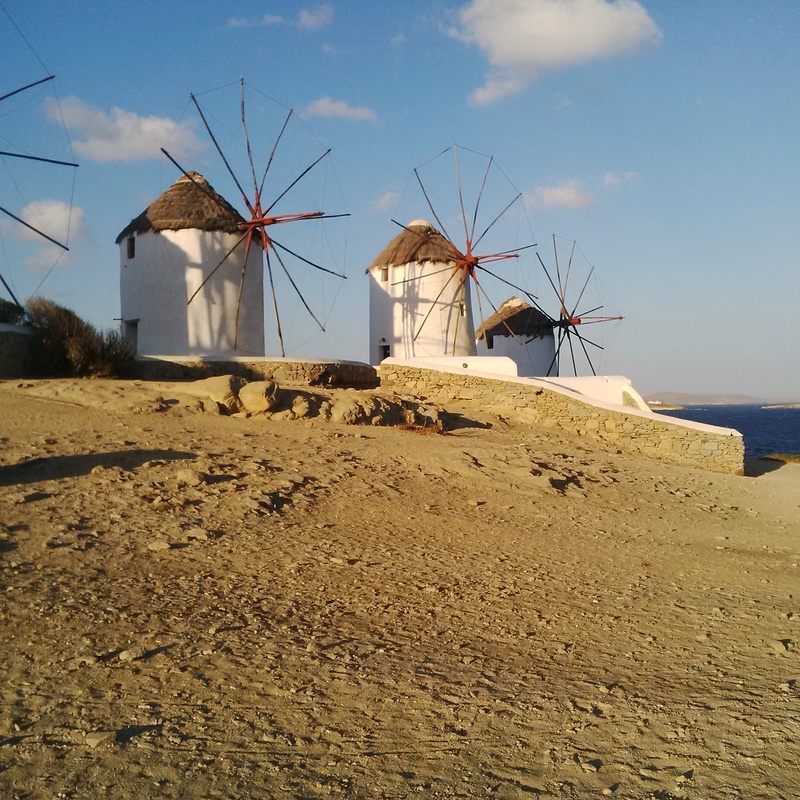 Touring Mykonos | Turning my world upside down! We got up and out by 7am and drove towards a town named Korfos for a bite to eat. I was frankly starving by this time, with the last meal having been before 4pm the previous day. Unfortunately we couldn’t find a restaurant open at this hour for me to have eggs. The bakeries and cafes were already filling and the smell of pastry sure was enticing. 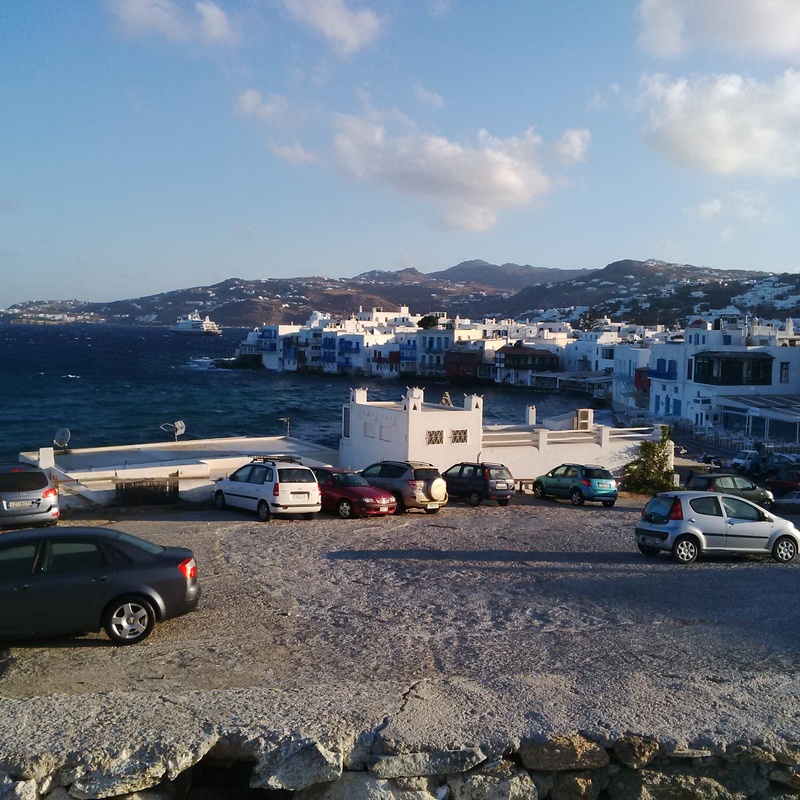 We drove around to have a look and then went back into Mykonos town where we found a perfect place to eat and park our vehicle for a few hours. 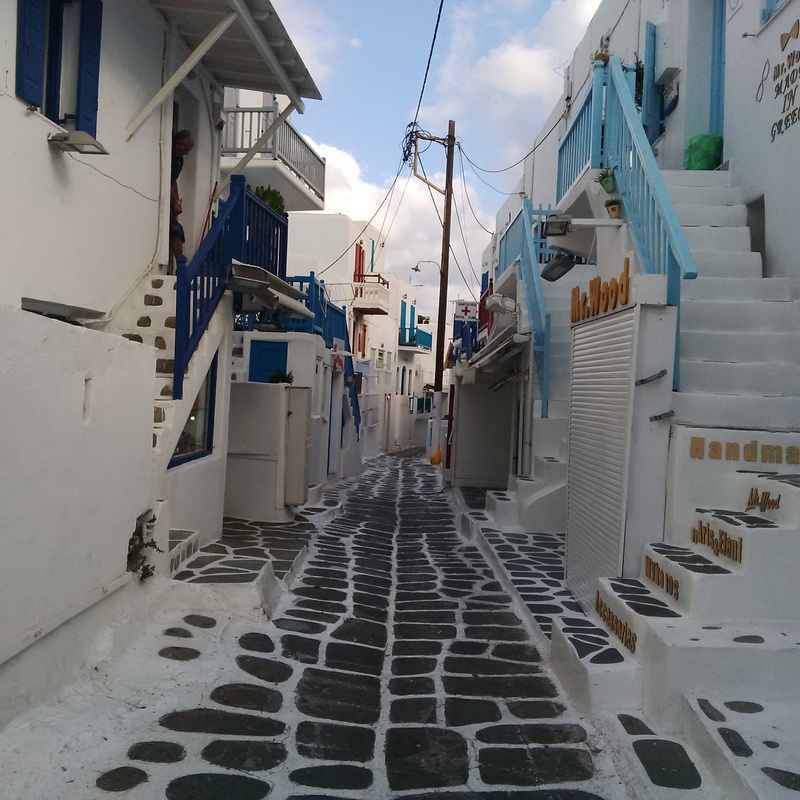 After breakfast, we walked leisurely around Mykonos before most people arrived from the cruise ships. The town is very charming with a Venetian quarter, windmills and some fabulous little shops. Of course the old port adds to the charm and beauty of the place. By 11am, we decided to go on an adventure and packed our bathing suits to find some beaches on the other side of the island. We first drove to the place where the movie Shirley Valentine was filmed, the back to Ornos beach and on to 2 other beaches, Fletia and Panormos. The second one had a fabulous beach club that offered beach loungers, bar service, dining rooms and massage for a price, of course. The beach was a bit sheltered but not enough to want to lie in the sun and get sandblasted for a lot of money. We moved on. At the last beach, Sostia, we took a walk in the sand and decided the water was too cold and the wind too strong to want to hang out. We drove back to Panormos and had a cold drink at the local taverna. We went back to our hotel for a little while and then down to Ornos beach for a late lunch/dinner. This was a very different scene from the morning with the whole beach filled with people, rather beautiful ones actually, sitting on loungers, enjoying food and drink and just sunning themselves. Had we known, we might have spent the day there. But then we wouldn’t have seen the island at all. We settled on a traditional Greek restaurant across the street from the beach and enjoyed a lovely dinner. Mine was a beef and onions stew, Leon’s was slow roasted lamb. Yum! After dinner, we walked for a short while and went back to the room to blog and read. I lasted about 5 minutes and fell asleep somewhere around 7pm. At least I got almost 7 hours of sleep last night, but I woke up at 3am never to fall asleep again. We wanted to check out early anyway, which we did before returning the quad and having breakfast on the waterfront in town. Aren’t the white buildings gorgeous against the blue of the ocean. Your photos are so pretty. Thanks! So many nice buildings in the islands. Wait till I post my Santorini photos.